Speech on How to make an Ice Cream? Good morning people. Today I wish to put forward a speech in front of you on the topic ‘how to make an ice-cream’, and I wish your full co-operation throughout the time that I will be presenting. Also, kindly pardon me for any mistake that I commit in this course. Ice-creams are favourite of all…children and adults alike, right? Ice creams score the top list when it comes to the world’s most famous dishes. Ice-cream is basically a very simple dish but it comes in various flavours, various colours, various quantities and most importantly various prices. Sometimes it called ‘ice-gola’, sometimes it is called ‘gelato’ and sometimes it is called ‘ice-cream’. Whatever the name be, the love for it remains the same. Some children visit the dentist only with the hope that after the difficult time at the dentist’s they will get to have their favorite ice-cream. Ice-creams are now available in various types. Some ice-creams are made without the ‘cream’, they are just ice and added flavours, those ice creams are cheaper. Some ice-creams are made with rich milk or ‘cream’, which can be called an ice-cream. 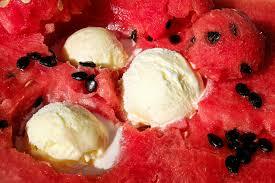 Whereas there are some other types of ice-creams which are made of fruits, frozen fruits and other different items. The most common flavours available in the milk ice-cream section are – mango, black current, vanilla, strawberry, butterscotch, orange etc. Today I am going to tell you the process of how to make a vanilla ice-cream. Vanilla ice-creams are the most common ice-creams that you’ll ever find in a local market. It is the primary flavour. The other flavours are created by mixing with the vanilla flavour. The ingredients of a home made vanilla ice-cream are so small that you barely need to list them down. But since beginners might find it difficult I am listing them down. (Note: – there are various ways to make a vanilla ice-cream, different methods might require different equipment’s and ingredients. What I have listed here is only the general ways that people follow to make an ice-cream). Pour sugar, cream and milk in a saucepan. Add sugar according to your taste. Now you have to heat the mixture in a saucepan under low heat. Keep heating the mixture until small ring of bubbles or foam appear round the edge of the saucepan. Transfer the mixture into a container immediately. Now mix vanilla extract or essence with mixture. Vanilla essence is easily available in local market. Stir is thoroughly. Cool down the mixture to chilly cold for at least two hours. Keeping it overnight is the best option. The next step is to pour the ice cream mix into an ice-cream maker and churn the mixture thoroughly. We have to churn the mixture according to the directions given by the manufacturer. Or you can place the mixture in a shape maker or any appropriate plastic cup and put it in refrigerator for 2-3 hours for it to set and harden. Separate the egg-yolks from the whitish part very carefully. Now we have to cook this base under low heat. We have to keep it cooking unless it forms a custard like thick paste. Strain the mixture in a bowl and keep it for chilling. Chill it unless it’s cold. Chilling overnight would be best. Churn the ice-cream and let it to harden in freezer. Serve cold and garnish according to your choice. The garnishing added can be according to your choice. There is a wide variety of items to choose from – dry fruits, chocolate sauce, artificial flavours, fruits syrups etc. Any kind of homemade item is good for health. Hence, it is best to try out this recipe at home and enjoy it then and there.